Four KAA Teaching Kits have been assembled for use by Kansas Anthropological Association members in presenting programs to the public. 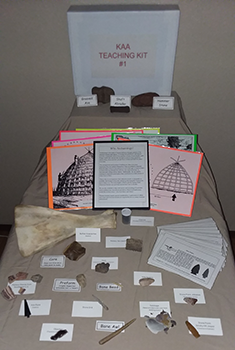 Each kit contains a range of prehistoric artifacts from unprovenienced collections, information cue cards explaining the functions of these artifacts, and six small posters illustrating prehistoric dwelling features and horticultural lifestyle in Kansas. There is also a helpful timeline and a suggested outline for presentations, as well as a magnifying glass for close examination of the artifacts. With these tools a presenter has a ready program to give to those with little knowledge of Kansas archeology. Depending on the explanation desired, the program may take from thirty minutes to an hour. The program may be expanded as appropriate for the interest group and the time allotment. Civic groups, schools, historical societies, chapter meetings, workshops, and booths are all potential venues for use of these kits. In addition to providing the hands-on experience with prehistoric artifacts for the audience, the KAA member will explain the function of the organization and its goals, and invite all to participate in the responsible stewardship of Kansas' archeological heritage. 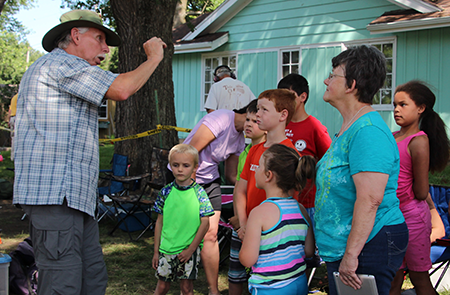 Public education will promote knowledge and appreciation of that heritage as well as invite participants to join in the discovery, documentation, and preservation of Kansas prehistory.